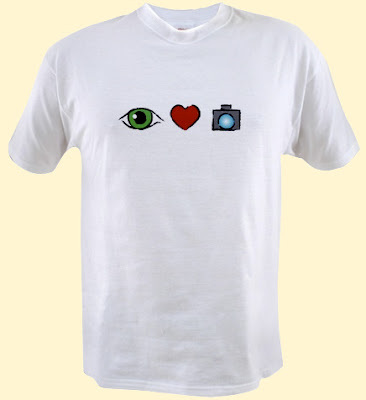 What the Duck's new "I Love Photography" merchandise. The design: Simple. Clean. Quirky. Communicative. Kewl! We like. Love the blog. I notice a small landscape picture has appeared on the left hand side above music reviews. Just wondering what the image should be off? or has my browser just gone a bit mad? That's supposed to be a small Amazon ad. It looks to be one on my browser. The big problem with these Amazon links is that they're "served" by Amazon, meaning that Amazon keeps control of what appears on my blog. I've never liked that. I don't allow "flashing" ads because I think they're annoying and distracting, and I've never liked the Amazon ad links. But as to how one of your own pictures is showing up where the ad should be, that is a total mystery to me. I can't shed any light on that whatsoever. Ho hum - thanks Mike. was ripped a very tiny hole only after twice or 3 times of wearing.. Eye too would like thicker shirts. But anyhoo, I ordered three dark tees (black, navy, charcoal). Thanks for the tip, I really like the design. I have a neat tee, white on black, with the word iLove under a logo which looks like the Apple logo, except it's a heart. Kewl.